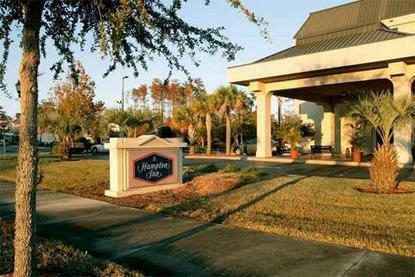 Hampton Inn Daytona/Ormond Beach is conveniently located at the junction of I-95 and Route 40, just a short five mile drive from the beach. We are the perfect hub for day trips to the surrounding tourist areas of St. Augustine, Orlando, Disney World, and Cape Kennedy. Other attractions include greyhound racing, NASCAR race track, and Daytona International Speedway's motorsport museum. We can make arrangements for deep sea fishing, or tickets/transportation to Disney World Theme Park, Epcot, and SeaWorld. Within .8 mile you can dine at Applebee's, Boston Market, Delcato's Italian, or Outback Steakhouse. We feature 84 rooms, including king rooms with Jacuzzi and micro/fridge, golf, packages, an on-premise exercise room, swimming pool, and meeting room. Amenities include complimentary continental breakfast, in-room coffee maker, internet access, and TV with cable. We also offer connecting rooms, cribs, and irons and ironing boards. Laundry/valet services, guest/laundromat, meeting/banquet facilities, audio visual equipment.